Granada isn’t all about the Alhambra, it’s also about dust and grime – especially when searching around junk shops. We’re no strangers to these places – see here and here – and it’s always nice to pick up a bargain, which we did this week. Some of our readers may be aware of the UK TV programme ‘Antiques Roadshow’ where people carrying Sainsbury’s shopping bags in places like Windsor turn up with all manner of garbage only for experts to tell them to go away – unless they have something of interest and/or value. 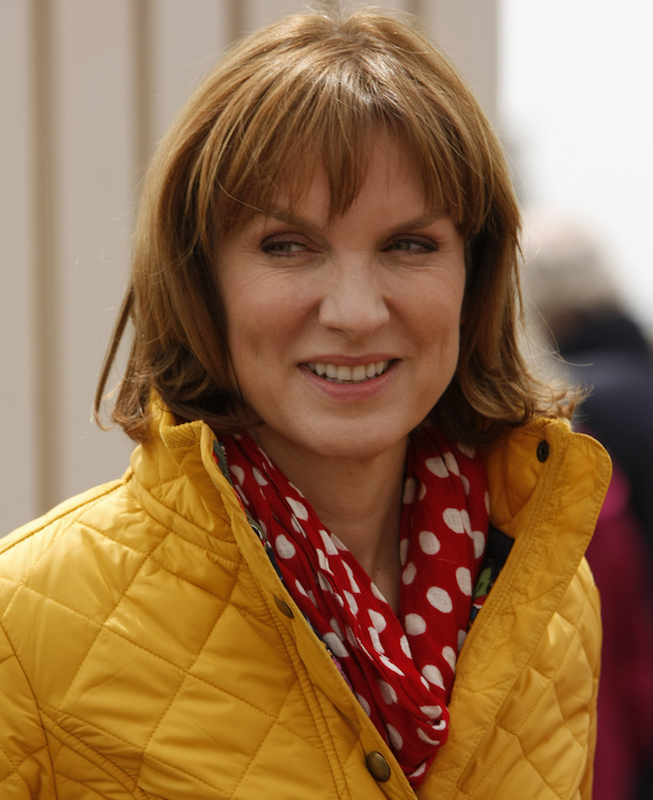 (M was a particular fan of the show as he once lived a few doors from the presenter, Fiona Bruce, in Greenwich, who lived above a junk shop). Like a besotted school boy he’d admire her powder blue work outfits while waiting for the always-late 0814 to Cannon Street. 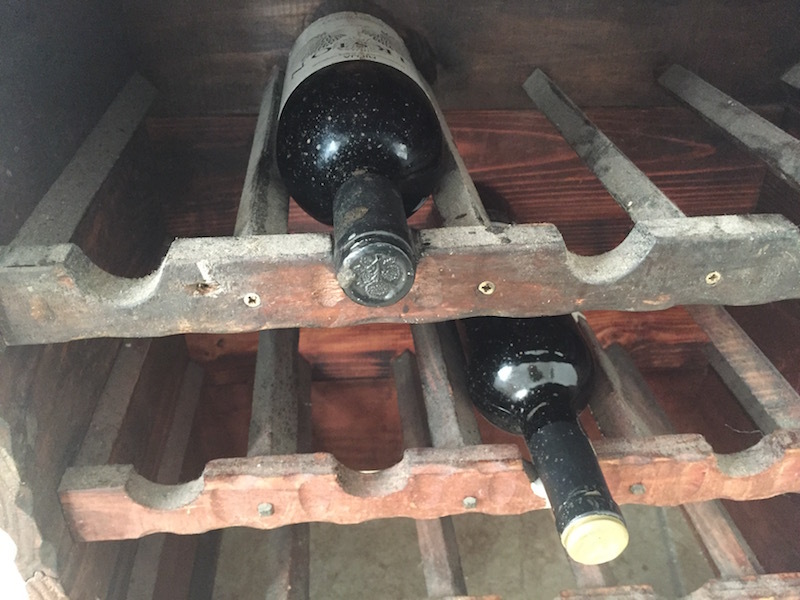 This week our piece of garbage, which S spotted next to a stack of those glass plates that go in the bottom of microwaves, was a 20-bottle wine rack. It had a battered charm and was, we were told, from a house in Granada and about fifty years old. So not an antique by any stretch of the imagination but we needed one for our 19 bottles of fizzy water and one bottle of wine. 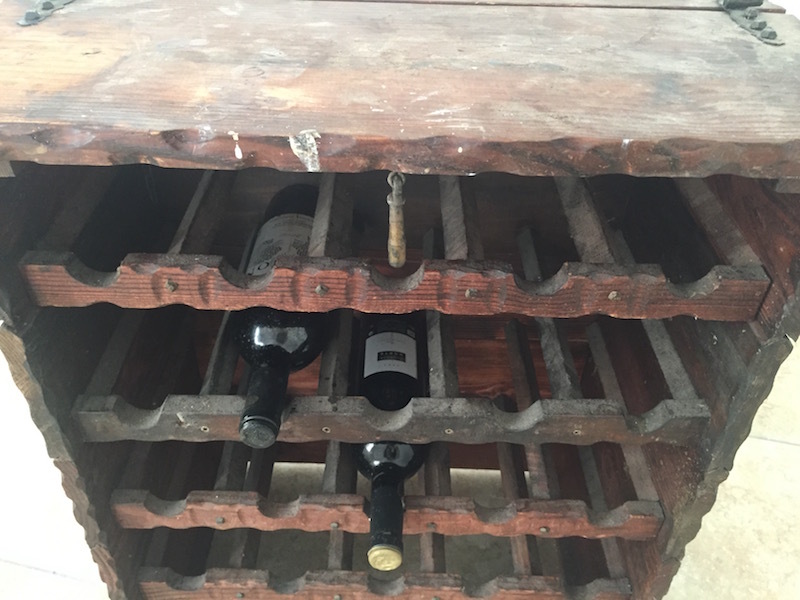 Perhaps this was our opportunity to finally start a ‘wine cellar’ next to the linen bin. Following a cafe con leche next door and thinking that a bottle of any drinkable wine from a supermarket would cost at least 4€, we decided this paint-spattered and creaky object should remain attached to its bottles. So 30€ it was to the two idiot foreigners at the back. We left, pressing the notes into his hand hoping no-one noticed. And wrapped in those silver sheets people put over their car steering wheels so they don’t get too hot in the sun, the bottles were brought home like newborn twins (although not identical). 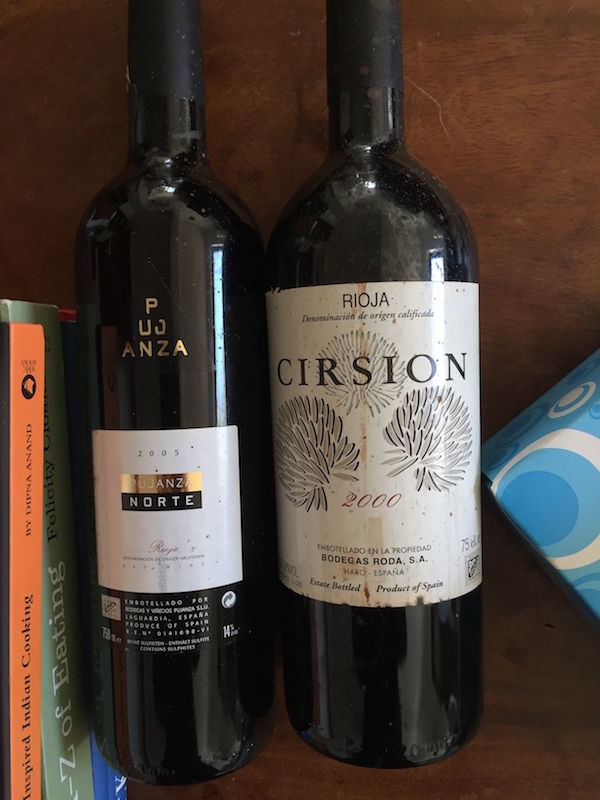 Should, reader, you be a wine buff, the two bottles are a Cirsion Bodegas Roda – 2000 and a 2005 Pujanza ‘Norte’. The first has a dribble of something down the label, maybe pig’s blood, while the latter looks like it could have been plucked off a shop shelf that day. We did a Google search and also tweeted to Master of Wine, Tim Atkin, who replied that we’d done very well – for both bottles with the latter from ‘an amazing vineyard.’ Check his 2017 Rioja Special Report here and check him out on Twitter (@Timatkin). Following more research we discovered the Cirsion bottle is worth around 150€ and the Pujanza Norte around 50€ – although this website for a shop in London has the Cirsion at £208! (opens in new window). We looked lovingly at the twins, cooing just a little. Suddenly, all those hours spent in junk shops, in fear of being crushed by falling crucifixes, stuffed animals and furniture, seemed worth it – albeit for something that would last about an hour. Not in a million years would we be able to afford wine like this, unless we won El Gordo. The debate is ongoing as to when we should drink them. When Arsenal next win the league or when Fiona Bruce pays us a visit are leading the pack. Or perhaps when the next day of the week has a ‘Y’ in it. Lucky idiot foreigners, we guess. So, how did it taste?! We haven’t had it yet…will report back when we do.